I like to lift heavy stuff, which means I’m always looking for great ways to get more protein in my life. And what better way now that the weather is getting cold, than to sip it hot? Yep, I’m talking about bone broth. At first, the name totally turned me off. It sounds like something my grandmother would have tried to force on me to get rid of a cold when I was a kid … something I probably would have rolled my eyes at. But bone broth has been used throughout history all over the world due to its simplicity. It’s an inexpensive traditional food that packs a powerful nutritive punch. Unlike traditional broths, bone broth is made with (you guessed it) bones which have been roasted, then simmered in water. Unlike stock, bone broth is simmered for anywhere from 8 to upwards of 24 hours. While the bones are simmering, minerals and other nutrients leach from the bones into the bone broth, especially if cider vinegar has been added like in the Bonafide Provisions bone broths that I use. 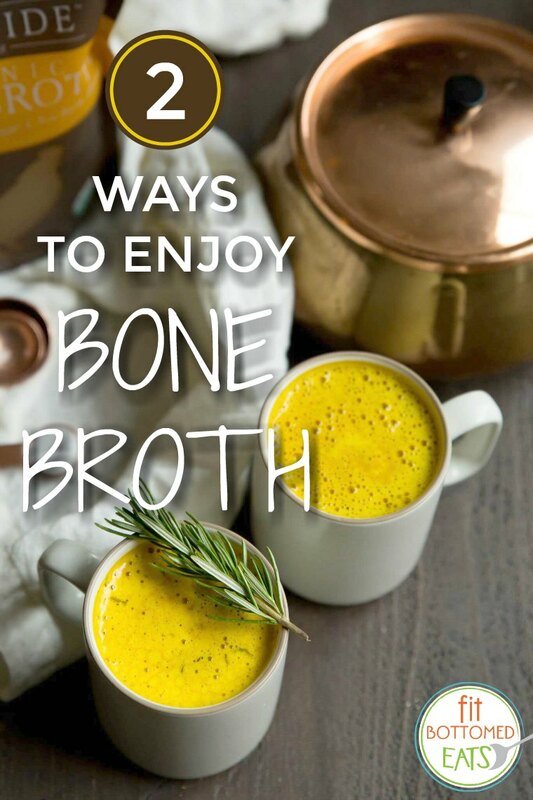 Bone broth is rich in all sorts of helpful stuff like protein, glycine, gelatin, calcium, magnesium, phosphorus, glucosamine, chondroiton, and other trace minerals. 1. Straight up. I really kinda dig it this way. Unlike a protein shake, bone broth is thin so you don’t really even feel like you’re drinking your nutrition (which is still the part that bugs me about protein shakes). And it was actually pretty soothing to have a cup of it in the evening as I was settling in for the night. It was like having a cup of protein tea — if there could be such a thing. Just be sure that you go with one of the more nutrient-dense brands — so many of the bone broths on the market seem kinda watery and lack flavor. Read the labels and verify that the broth is minimally-processed in order to preserve the nutrient density rather than degrade it. Also, be sure to check the sodium content so that you’re not going overboard there. 2. In a “latte.” When the people at Bonafide Provisions sent me this recipe to try, I was equal parts intrigued and skeptical, but their bone broth latte turned out to be pretty tasty. It was a slightly thicker and smoother method for downing the beverage. Somehow it really did feel a little fancier. Here’s the recipe so you can give it a shot, too. In a medium saucepan, heat up the broth on medium heat until it begins to simmer. Add spices and turn the temperature down to low. Let simmer for 2-3 minutes. Remove from heat and transfer to a high-speed blender pitcher. Add ghee plus a squeeze of lemon wedge and blend on medium-high for 30 seconds until frothy and well combined. Serve right away.